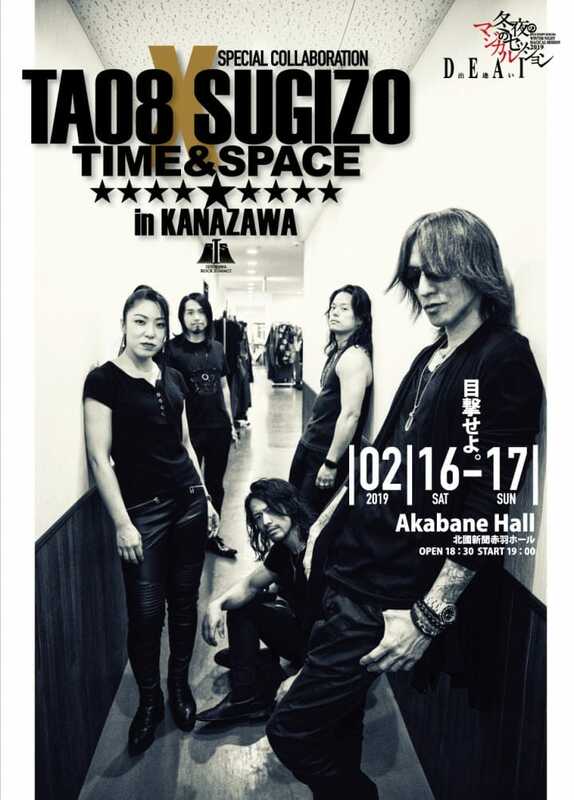 DRUM TAO 8 × SUGIZO「TIME & SPACE」in KANAZAWA. In this two-day event, Japan's super guitarist SUGIZO's (LUNA SEA) high energy, aggressive performance style will collide with DRUM TAO's martial art of drumming. Japanese rock meets classic drums! If you are a fan of Japanese taiko drums and happen to be in Japan in mid-February you shouldn't miss out on this once-in-a-lifetime event! The masters of taiko drumming meet the Japanese master of guitar. TAO8 are the chosen top eight performers of Japans famous taiko unit DRUM TAO. Considering that TAO is already one of Japans greatest performing units you can be sure to only get the best of the best with TAO8. SUGIZO is one of Japans greatest guitarist and part of two worldwide renowned Japanese bands, LUNA SEA and X JAPAN. In this two-day event, SUGIZO's high energy, aggressive performance style will collide with TAO8's martial art of drumming. Japanese rock meets classic drums! Don't miss out!